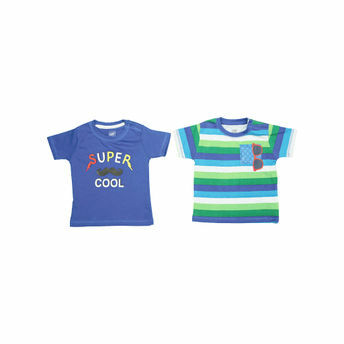 A versatile piece of clothing, Mee Mee T-shirts for little boys can be used daily to keep your baby chic and comfortable at home or outside while travelling. Made from premium quality, 100% Cotton, each top has snap buttons opening ensuring quick and easy dressing change for your baby with absolute great ease. Available in many colours & smart designs, they're perfect for a playdate or a party or any other baby activity. Explore the entire range of T-Shirts & Shirts available on Nykaa. Shop more Mee Mee products here.You can browse through the complete world of Mee Mee T-Shirts & Shirts .Alternatively, you can also find many more products from the Mee Mee T-Shirts For Boys - Royal Blue & Royal Stripe Pack Of 2 range.